The flight was made by aviatrice Katherine Stinson (above and below) on July 9, 1918, from Calgary to Edmonton, containing a mailbag with a reported 259 letters. In honor of Stinson, flight 3143 will be flown by WestJet Encore Captain’s Athenia Jansen and Janna Breker Kettner. Photos: U.S. Library of Congress. WestJet on July 9 in collaboration with the Canadian Aerophilatelic Society and The Calgary Airport Authority celebrated the 100th anniversary of Western Canada’s inaugural air mail flight. The flight was made by aviatrice Katherine Stinson on July 9, 1918, from Calgary to Edmonton, containing a mailbag with a reported 259 letters. 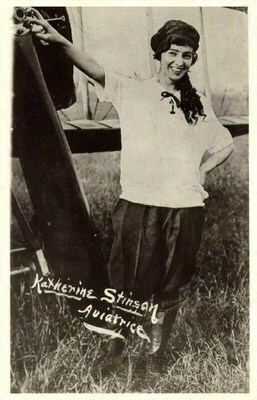 Known by the press as “the birdgirl,” Katherine Stinson piloted the first flight using a compass and a map of Alberta. It was the first time in the West and the second time in all of Canada that mail had been transported by air. The plane Stinson flew was custom-built using parts from a number of First World War era aircraft. Her trip also resulted in the first-ever landing on terrain in the immediate vicinity of the present-day YYC Calgary International Airport. WestJet Encore flight 3143 from Calgary to Edmonton will be used to commemorate this unique occasion. The flight will also transport 259 letters destined for Edmonton from Calgary including a letter from Calgary Mayor, Naheed Nenshi to the Mayor of Edmonton, Don Iveson. The original mail bag contained a letter from the acting Calgary Mayor Freeze to then Mayor Evans of Edmonton. In honour of Stinson, flight 3143 will be flown by WestJet Encore Captain’s Athenia Jansen and Janna Breker Kettner. This entry was posted in WestJet and tagged WestJet on July 6, 2018 by Bruce Drum.